For the cured but uncooked leg of pork, see Gammon (meat). For other uses, see Ham (disambiguation). Ham is pork from a leg cut that has been preserved by wet or dry curing, with or without smoking. As a processed meat, the term "ham" includes both whole cuts of meat and ones that have been mechanically formed. There are claims that the Chinese were the first people to mention the production of cured ham. Larousse Gastronomique claims an origin from Gaul. It was certainly well established by the Roman period, as evidenced by an import trade from Gaul mentioned by Marcus Terentius Varro in his writings. The modern word "ham" is derived from the Old English ham or hom meaning the hollow or bend of the knee, from a Germanic base where it meant "crooked". It began to refer to the cut of pork derived from the hind leg of a pig around the 15th century. Ham is produced by curing raw pork by salting, also known as dry curing, or brining, also known as wet curing. Additionally, smoking may be employed. Besides salt, several ingredients may be used to obtain flavoring and preservation, from black pepper (e.g. Prosciutto Toscano) to saffron (e.g. the "Zafferano di San Gimignano"). 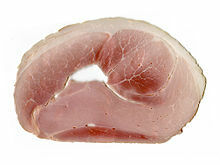 Traditional dry cure hams may use only salt as the curative agent, such as with San Daniele or Parma hams, although this is comparatively rare. This process involves cleaning the raw meat, covering it in salt while it is gradually pressed draining all the blood. Specific herbs and spices may be used to add flavour during this step. The hams are then washed and hung in a dark, temperature-regulated place until dry. It is then hung to air for another period of time. The duration of the curing process varies by the type of ham, with, for example, Serrano ham curing in 9–12 months, Parma hams taking more than 12 months, and Iberian ham taking up to 2 years to reach the desired flavour characteristics. Some dry cured hams, such as the Jinhua ham, take approximately 8 to 10 months to complete. Most modern dry cure hams also use nitrites (either sodium nitrite or potassium nitrate), which are added along with the salt. Nitrates are used because they prevent bacterial growth and, in a reaction with the meat's myoglobin, give the product a desirable dark red color. The amount and mixture of salt and nitrites used have an effect on the shrinkage of the meat. Because of the toxicity of nitrite (the lethal dose of nitrite for humans is about 22 mg per kg body weight), some areas specify a maximum allowable content of nitrite in the final product. Under certain conditions, especially during cooking, nitrites in meat can react with degradation products of amino acids, forming nitrosamines, which are known carcinogens. The dry curing of ham involves a number of enzymatic reactions. The enzymes involved are proteinases (cathepsins – B, D, H & L, and calpains) and exopeptidases (peptidase and aminopeptidase). These enzymes cause proteolysis of muscle tissue, which creates large numbers of small peptides and free amino acids, while the adipose tissue undergoes lipolysis to create free fatty acids. Salt and phosphates act as strong inhibitors of proteolytic activity. Animal factors influencing enzymatic activity include age, weight, and breed. During the process itself, conditions such as temperature, duration, water content, redox potential, and salt content all have an effect. The salt content in dry-cured ham varies throughout a piece of meat, with gradients determinable through sampling and testing or non-invasively through CT scanning. Wet-cured hams are brined, which involves the immersion of the meat in a brine, sometimes with other ingredients such as sugar also added for flavour. Meat is typically kept in the brine for around 3 to 14 days. Wet curing also has the effect of increasing volume and weight of the finished product, by about 4%. The wet curing process can also be achieved by pumping the curing solution into the meat. This can be quicker, increase the weight of the finished product by more than immersion, and ensure a more even distribution of salt through the meat. This process is quicker than traditional brining, normally being completed in a few days. Ham can also be additionally preserved through smoking, in which the meat is placed in a smokehouse (or equivalent) to be cured by the action of smoke. The main flavor compounds of smoked ham are guaiacol, and its 4-, 5-, and 6-methyl derivatives as well as 2,6-dimethylphenol. These compounds are produced by combustion of lignin, a major constituent of wood used in the smokehouse. In many countries the term is now protected by statute, with a specific definition. For instance, in the United States, the Code of Federal Regulations (CFR) says that "the word 'ham', without any prefix indicating the species of animal from which derived, shall be used in labeling only in connection with the hind legs of swine". In addition to the main categories, some processing choices can affect legal labeling. For instance, in the United States, a "smoked" ham must have been smoked by hanging over burning wood chips in a smokehouse or an atomized spray of liquid smoke such that the product appearance is equivalent; a "hickory-smoked" ham must have been smoked using only hickory. However, injecting "smoke flavor" is not legal grounds for claiming the ham was "smoked"; these are labeled "smoke flavor added". Hams can only be labeled "honey-cured" if honey was at least 50% of the sweetener used, is at least 3% of the formula, and has a discernible effect on flavor. So-called "lean" and "extra lean" hams must adhere to maximum levels of fat and cholesterol per 100 grams of product. Whole fresh pork leg can be labeled as fresh ham in the United States. A number of hams worldwide have some level of protection of their unique characteristics, usually relating to their method of preservation or location of production or processing. Dependent on jurisdiction, rules may prevent any other product being sold with the particular appellation, such as through the European protected geographical indication. As a processed meat, there has been concern over the health effects of ham consumption. A meta-analysis study from 2012 has shown a statistically relevant correlation between processed meat consumption and the risk of pancreatic cancer, with an increase in consumption of 50 grams (1.8 oz) per day leading to a 19% increase in risk. This supported earlier studies, including the 2007 study Food, Nutrition, Physical Activity and the Prevention of Cancer: a Global Perspective, by the World Cancer Research Fund and the American Institute for Cancer Research, which reviewed more than 7,000 studies published worldwide. Among the recommendations was that, except for very rare occasions, people should avoid eating ham or other processed meats – cured, smoked, salted or chemically preserved meat products such as bacon, hot dogs, sausage, salami, and pastrami. The report states that once an individual reaches the 510 grams (18 oz) weekly limit for red meat, every 48 grams (1.7 oz) of processed meat consumed a day increases cancer risk by 21%. ^ Callow, EH (December 1947). "The Action of Salts and other Substances Used in the Curing of Bacon and Ham". British Journal of Nutrition. 1 (2–3): 269–274. doi:10.1079/bjn19470037. PMID 18907930. ^ a b Zeuthen, Peter (15 April 2008). Meat Fermentation Worldwide: History and Principles. ISBN 978-0-470-37634-8. ^ Larousse Gastronomique. Hamlyn. 2009. ISBN 978-0-600-62042-6. ^ Brown, Lesley, ed. (2007). Shorter Oxford English Dictionary. II (Sixth ed.). Oxford: Oxford University press. p. 3611. ^ "Labelling and Composition of Meat Products: Guidance Notes" (PDF). Food Standards Agency Scotland. p. 31. ^ a b "Curing Methods". Meat and Sausages.com. ^ Sentandreu, Miguel Angel; Toldrá, Fidel (2001). "Dipeptidyl peptidase activities along the processing of Serrano dry-cured ham". European Food Research and Technology. 213 (2): 83–87. doi:10.1007/s002170100355. ^ Wierbicki, Eugen; Howker, John J (1976). "Effect of salt, phosphates and other curing ingredients on shrinkage of lean pork meat and quality of smoked processed ham". Journal of Food Science. 41 (5): 1116–1121. doi:10.1111/j.1365-2621.1976.tb14399.x. ^ Jakszyn, P.; Gonzalez, C. A. (2006). "Nitrosamine and related food intake and gastric and oesophageal cancer risk: A systematic review of the epidemiological evidence". World Journal of Gastroenterology. 12 (27): 4296–4303. doi:10.3748/wjg.v12.i27.4296. PMC 4087738. PMID 16865769. ^ a b c Toldrá, Fidel; Flores, Mónica (1998). "The Role of Muscle Proteases and Lipases in Flavor Development During the Processing of Dry-Cured Ham". Critical Reviews in Food Science and Nutrition. 38 (4): 351–352. doi:10.1080/10408699891274237. PMID 9626490. ^ Sárraga, Carmen; Gil, Marta; Arnau, Jacint; Monfort, Josep M (1989). "Effect of curing salt and phosphate on the activity of porcine muscle proteases". Meat Science. 24 (4): 241–249. doi:10.1016/0309-1740(89)90042-9. PMID 22054673. ^ Sárraga, Carmen; Gil, Marta; García-Regueiro, José Antonio (1993). "Comparison of calpain and cathepsin (B,L and D) activities during dry-cured ham processing from heavy and large white pigs". Journal of the Science of Food and Agriculture. 62 (1): 71–75. doi:10.1002/jsfa.2740620110. ^ Vestergaard, Christian; Erbou, Søren G; Thauland, Torunn; Adler-Nissen, Jens; Berg, Per (January 2005). "Salt distribution in dry-cured ham measured by computed tomography and image analysis". Meat Science. 69 (1): 9–15. doi:10.1016/j.meatsci.2004.06.002. PMID 22062634. ^ Deibel, RH; Niven, CF (September 1958). "The occurrence and significance of a motile microorganism of the Genus Lactobacillus in ham curing brines". Applied Microbiology. 6 (5): 323–327. PMC 1057423. PMID 13571973. ^ "9 CFR 317.8 – False or misleading labeling or practices generally; specific prohibitions and requirements for labels and containers". Legal Information Institute. ^ "Zdaj uradno originalen: kraški pršut zaščiten v EU". ^ "Campaña informativa sobre los Productos del Ibérico del Ministerio de Agricultura de España". 22 May 2008. Archived from the original on 22 May 2008. Retrieved 8 September 2013. ^ Lori Alden. "Cook's Thesaurus: Ham". Food Subs. Retrieved 5 October 2008. ^ Larsson, SC; Wolk, A (2012). "Red and processed meat consumption and risk of pancreatic cancer: meta-analysis of prospective studies". British Journal of Cancer. 106 (3): 603–607. doi:10.1038/bjc.2011.585. PMC 3273353. PMID 22240790. ^ "Food, Nutrition, Physical Activity and the Prevention of Cancer: a Global Perspective" (PDF). The World Cancer Research Fund and the American Institute for Cancer Research. 31 October 2007. Retrieved 18 September 2009. ^ a b Tina Marie Macias (31 October 2007). "Body fat is linked to six types of cancers". Los Angeles Times. Retrieved 18 September 2009. ^ "Food, Nutrition, Physical Activity and the Prevention of Cancer: a Global Perspective" (PDF). The World Cancer Research Fund and the American Institute for Cancer Research. 31 October 2007. p. 117. Retrieved 18 September 2009. ^ "Be thin to cut cancer, study says". BBC News. 31 October 2007. Retrieved 18 September 2009. ^ Rohrmann; et al. (7 March 2013). "Meat consumption and mortality – results from the European Prospective Investigation into Cancer and Nutrition". BMC Medicine. 11 (63): 63. doi:10.1186/1741-7015-11-63. PMC 3599112. PMID 23497300. Wikimedia Commons has media related to Ham (food).